Making even a little progress on one of my incomplete projects is always a good thing. 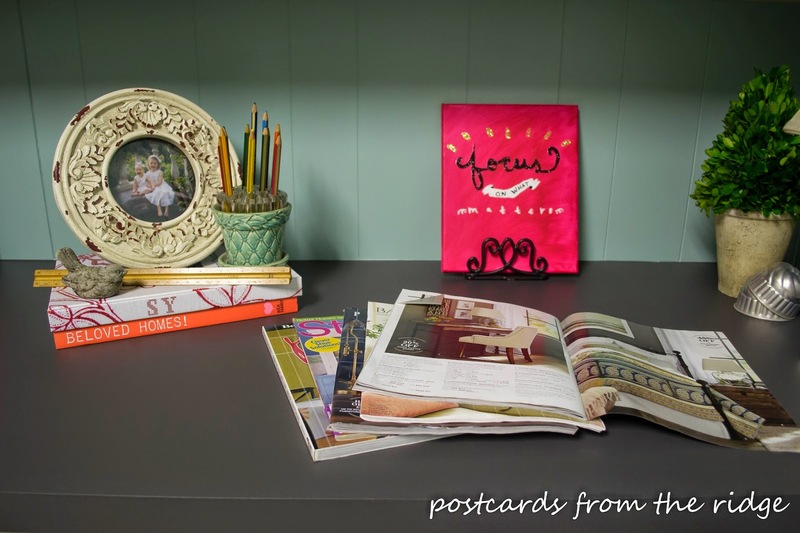 My craft room conversion project is one of those, and I've recently made lots of progress. At this rate, I might actually finish it before the year is over. LOL. 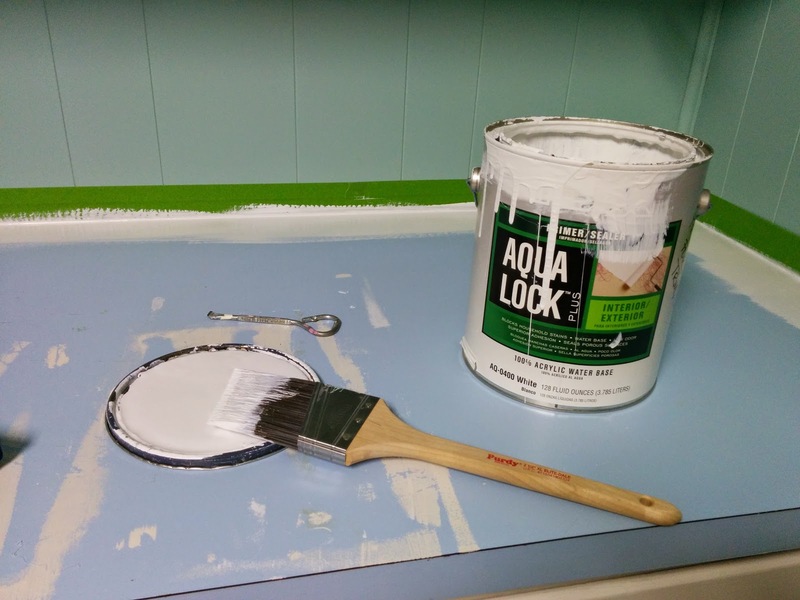 This room redo has been a multi-phased project. The most recent part of the puzzle was the counter tops. 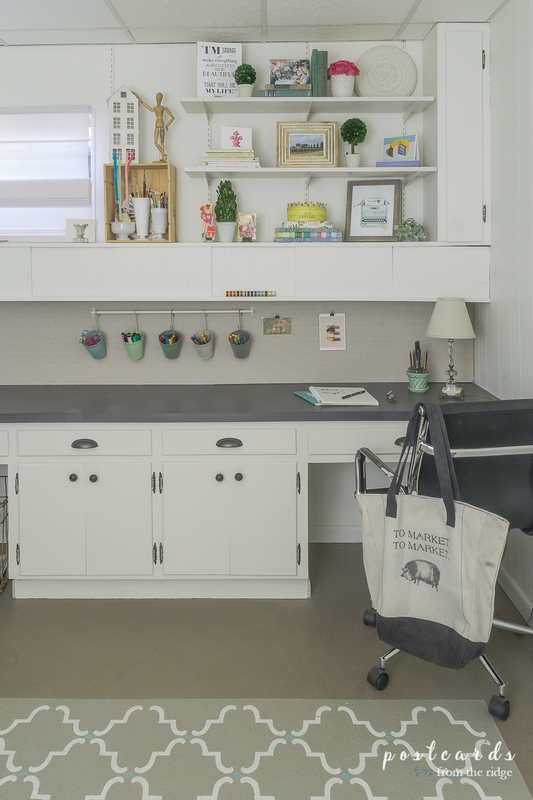 The room has a built-in desk area that I plan to use for crafts and creations. I recently accepted a challenge from Tide Oxi to use their product for a DIY project and I had the perfect use for it. Cover your eyes! Okay, uncover them now. The extremely ugly truth, aka the before shot. I honestly can't believe I'm showing you this. But what I want you to realize is that projects as daunting as this one can be accomplished if you keep working on it, even if it does take a while. Just keep chipping away at it and eventually you'll be done! 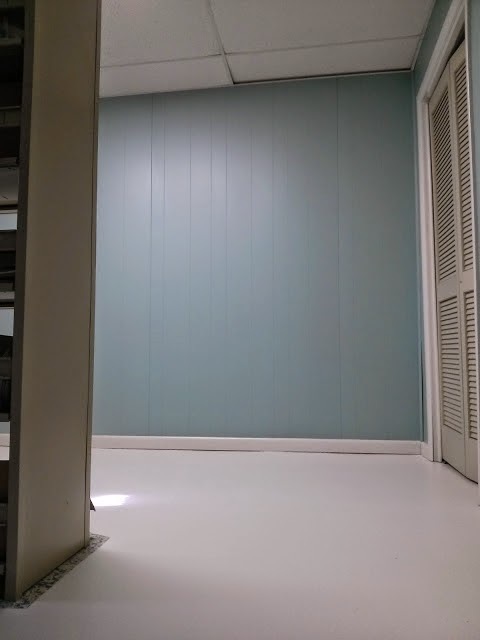 As you can see, this room needed a purge of epic proportions, a good cleaning, and a top-to-bottom makeover. We're talking ugly floor, dated paneling, and a sky blue counter top that didn't go with anything we own. Honestly there wasn't anything I liked about this room, but it was unused space that was screaming to be utilized. I did some purging, got my paint brush and started working on it. Two years ago. Yes, you read that right! I started this almost 2 years ago! Can you understand why I got a bit overwhelmed?? This room is very easy to ignore because it's tucked away in the far corner of our basement. 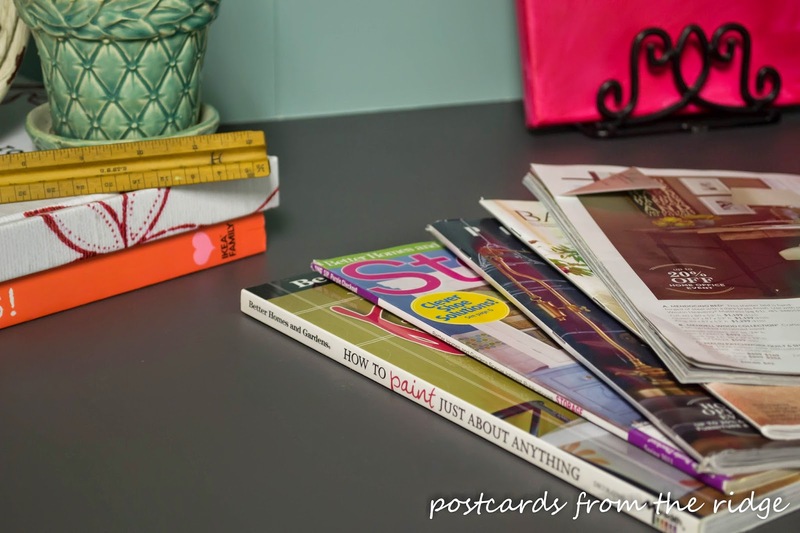 Ever since my husband stopped using it as an office 5 years ago, it's been a dumping ground for toys that have been outgrown, unnecessary office supplies, off-season clothes, and things that we just didn't know what to do with. That's all changing now. Here you can see the colors I tested on the wall. And the ugly floor. 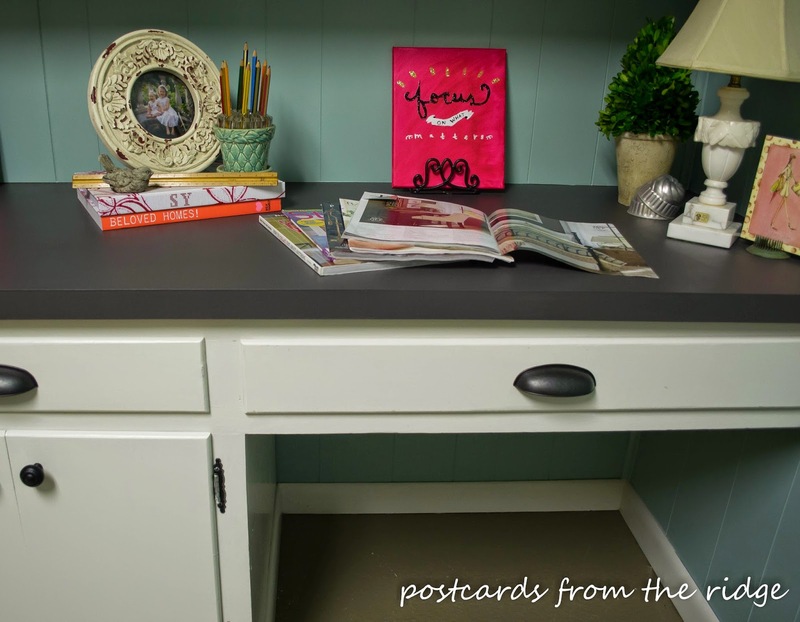 And a little peek of the blue counter top and putty colored cabinets. Here's a sneak peek at the walls and floor. Better already, huh? I'll have a full room reveal in a few weeks. Check back to see it all. It's totally different from that hideous before shot. 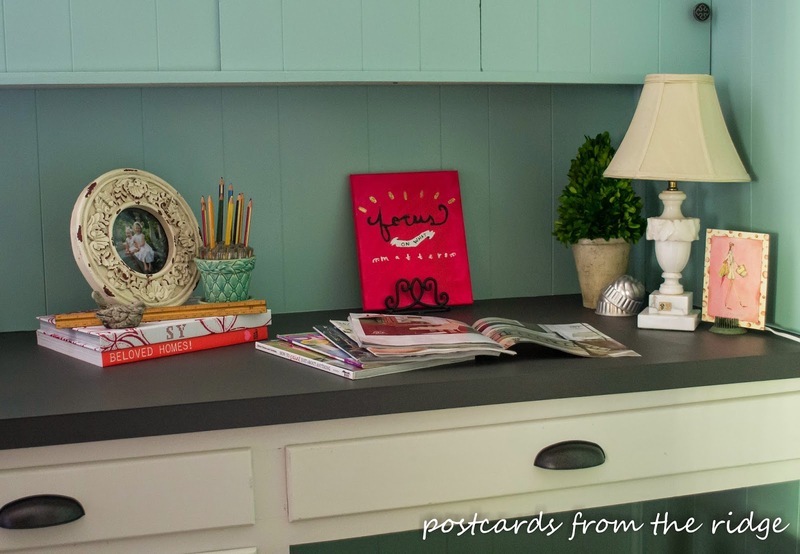 And if you have paneling in your home that you'd like to paint, go here to see a tutorial for that project. It's not as difficult as you might think, and it's so worth it! 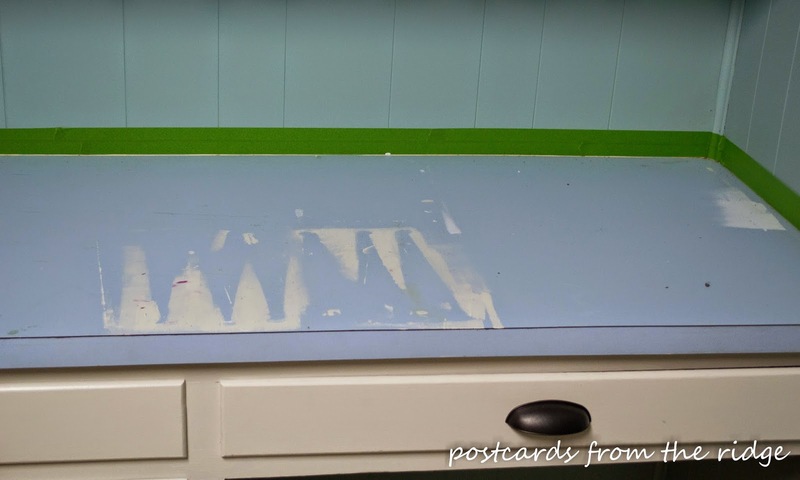 Now it's time to tackle the dated blue counter top. 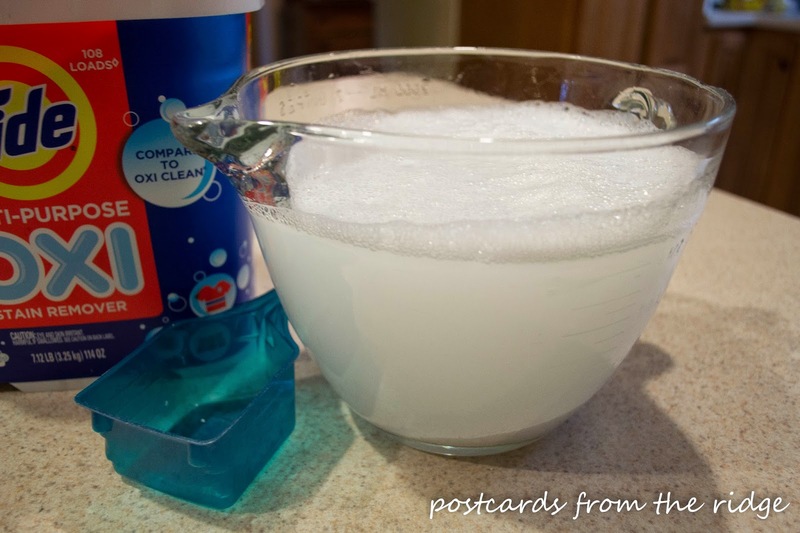 Clean the dirt and grime off the surface. I used Tide Oxi that I picked up at Home Depot for this job. It cleans upholstery, tile, grout, non-porous surfaces, and so much more. 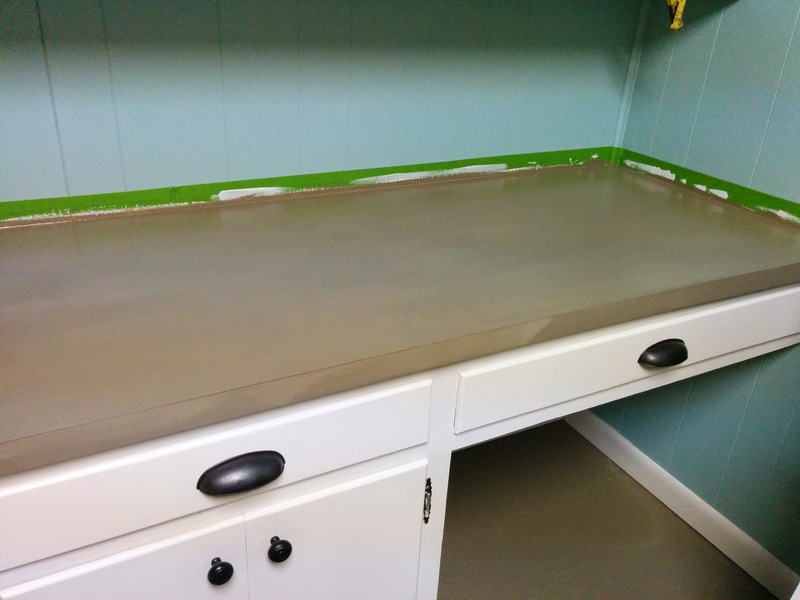 It worked wonders on the dirty sky blue counter top. I mixed the powder with the water according to the directions and then took it down to the craft room to clean the grimy counter. As a bonus, this stuff smells so good. Much better than other cleaners I've used. You can see how dirty it was. 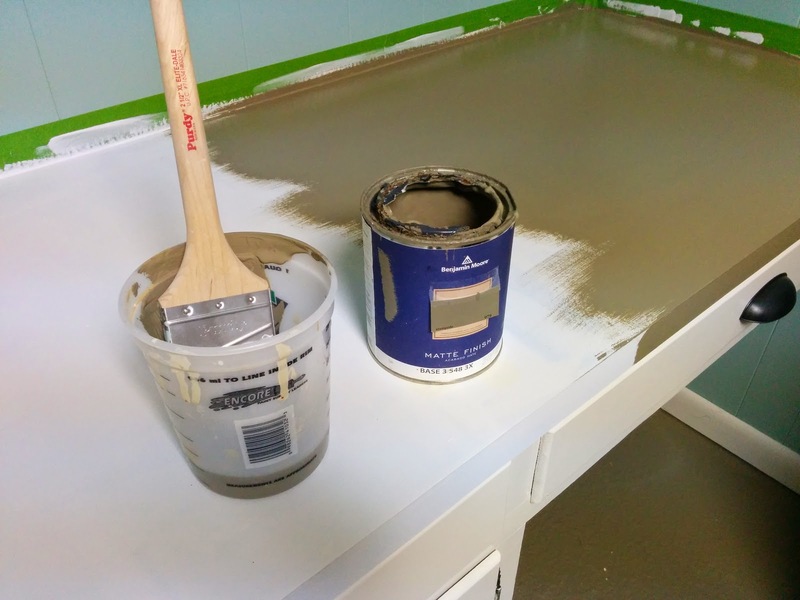 Since I knew I was going to prime and paint it anyway, I didn't mind that some of the paint and primer from the upper shelf brackets got on the counter. You can see that part of the project later. Now it's time to scrub, scrub, scrub the counter! 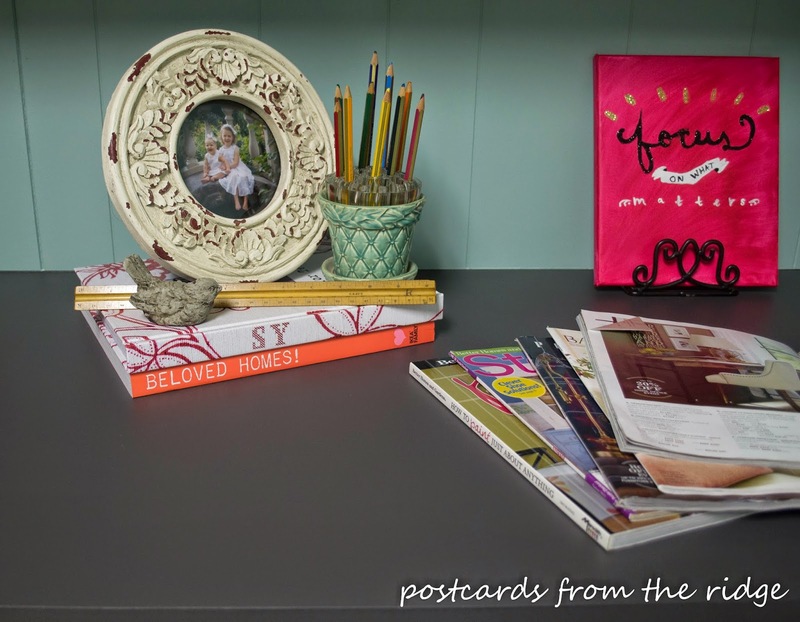 Before priming or painting, tape the edges to prevent the primer and paint from getting on your walls. I recommend this painters' tape. 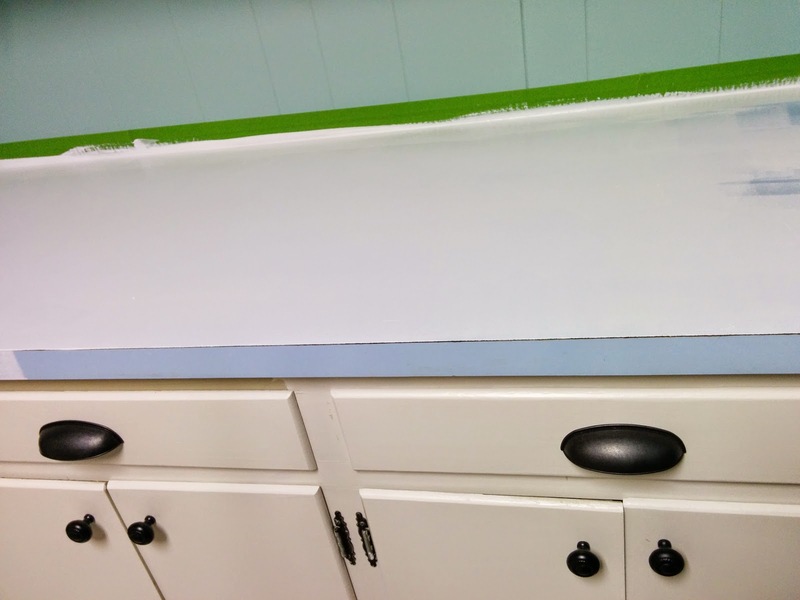 After the surface dried, I primed it with a 100% acrylic primer. 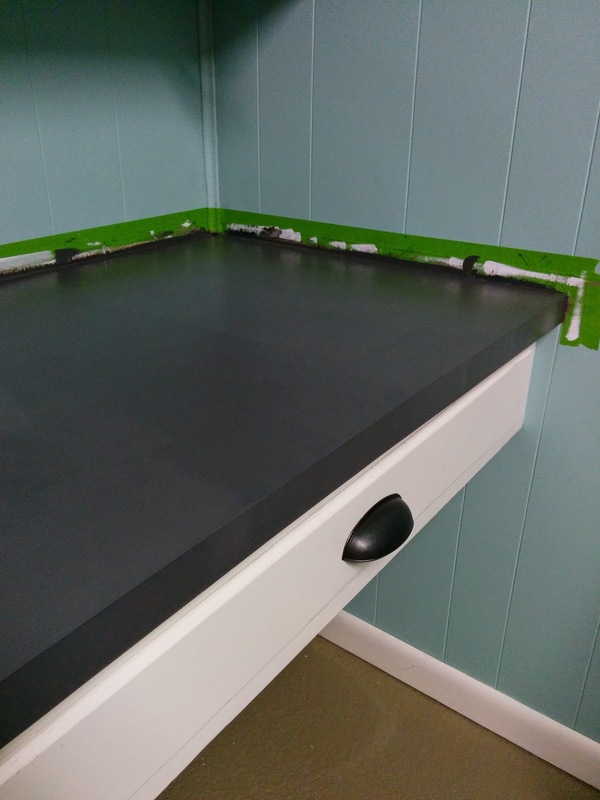 I used a brush to cut in around the edges and a small foam roller cover for the rest of the surface. Be sure to use a very short nap roller so you don't get a texture on the surface. 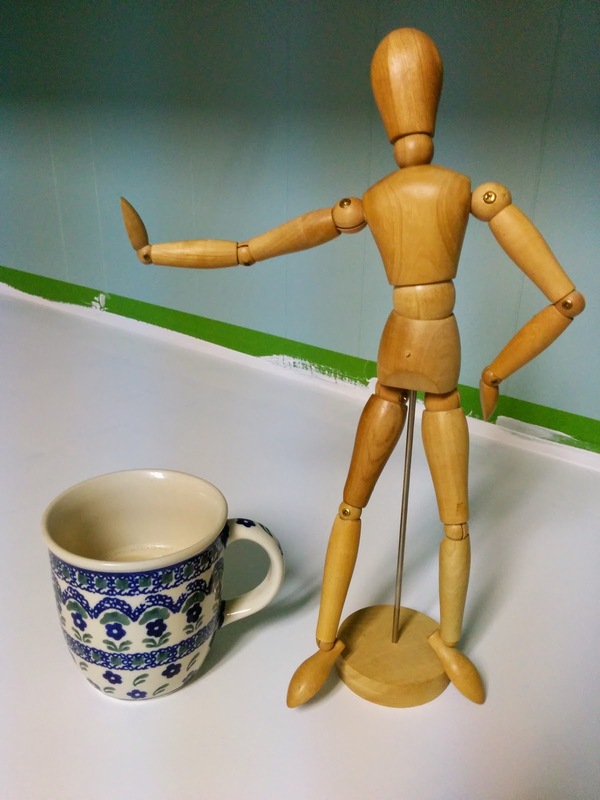 As the primer dries, take a coffee break and play with the wooden reticulated artist model. It loves to make sassy poses. Seriously though. Caffeine and a sense of humor makes even the worst projects better. 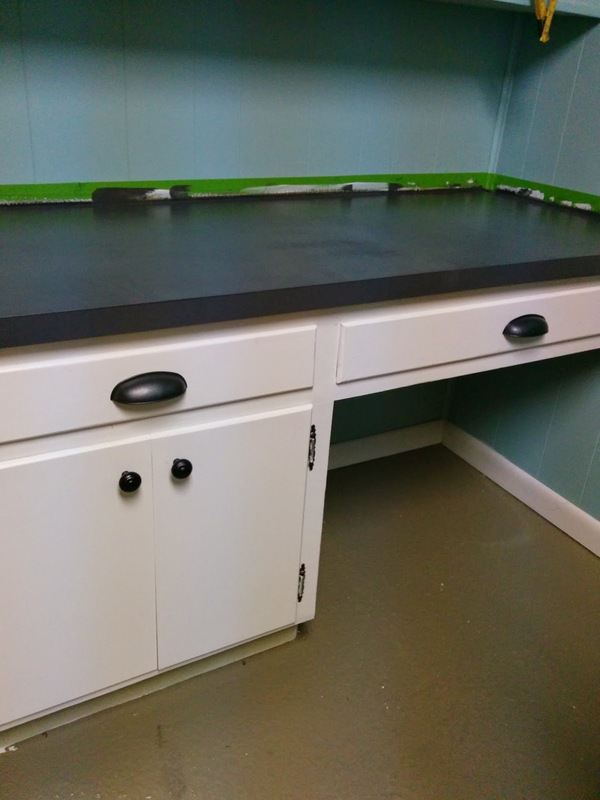 Paint the counter top with your chosen color. My first attempt was a color called Stampede. I attempted to make the counter look like weathered wood. And this is how it turned out. Not pretty at all. Time for plan B. I didn't have a plan B but I quickly came up with one. Aaaah, yes. This is much better, don't you think? 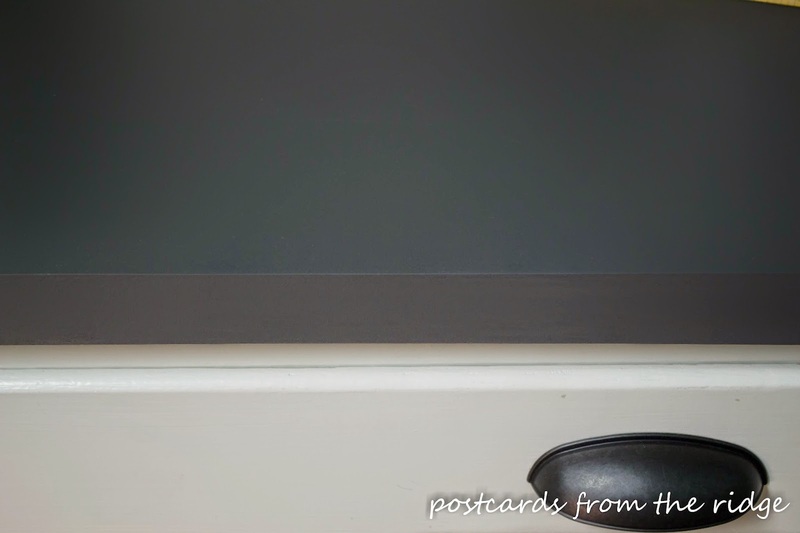 I mixed together several shades of paint that I had on hand including Onyx, Stampede, and Stone Hearth to come up with this pretty charcoal color. I love the way it complements the wall colors and everything else you see here. After the paint dried completely, I applied a couple of coats of clear acrylic for protection, then removed the tape. 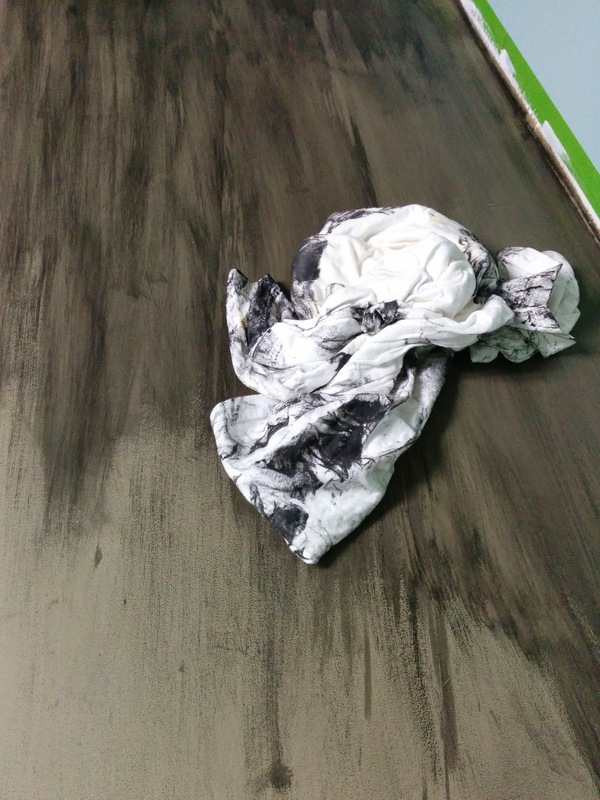 Note: the floor has one coat of primer and one coat of paint. I'll be adding another coat of paint and a stenciled faux rug in the next few weeks. You don't want to miss that! 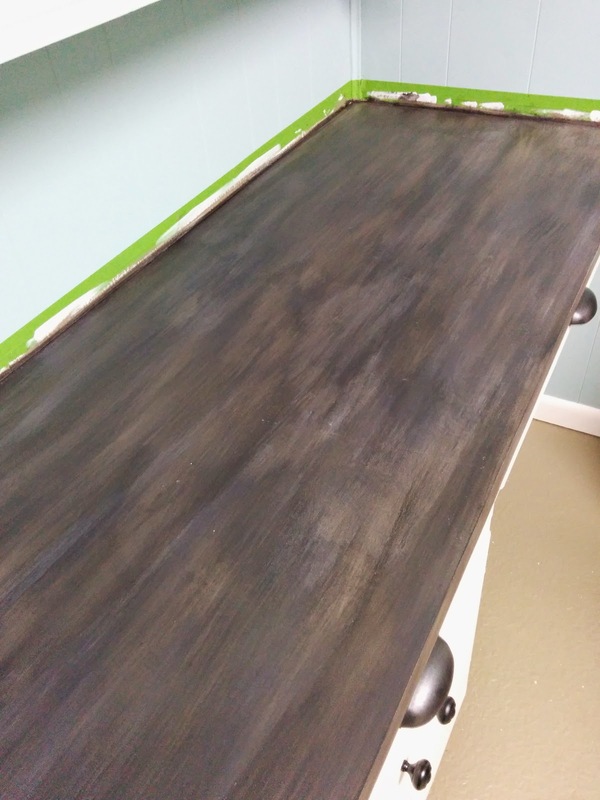 Update: go HERE for the stencilled floor tutorial and reveal. 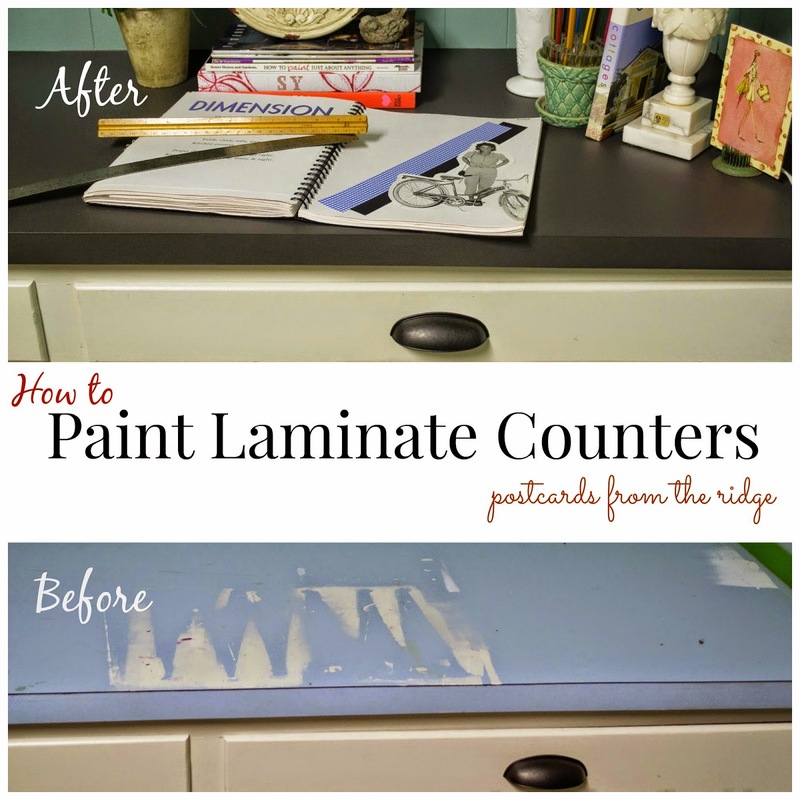 I can't believe what a difference it made changing the color of the counter. I love the way it looks. 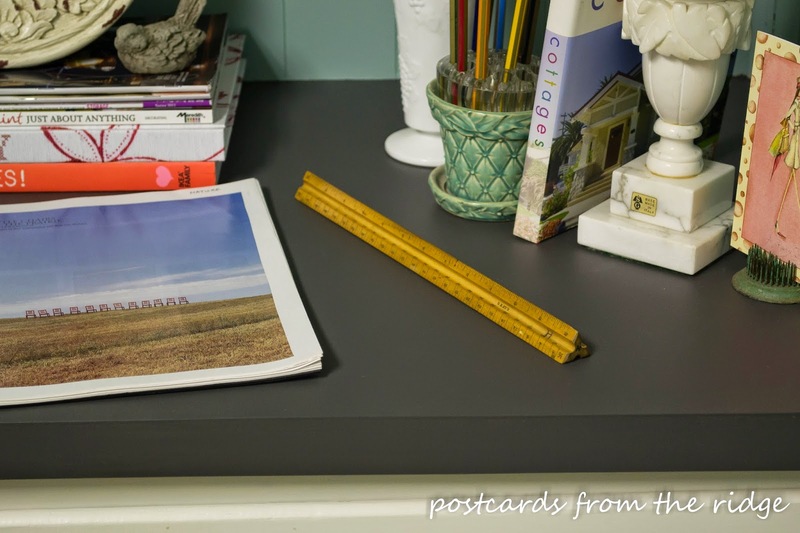 It reminds me of soapstone counters that I've seen for much more than my paint cost! The craft supplies still have to be organized as does the double closet. Watch for a reveal for those areas in the next few weeks. I know there will be many creations made here! Now I can't wait to finish the rest of the room! 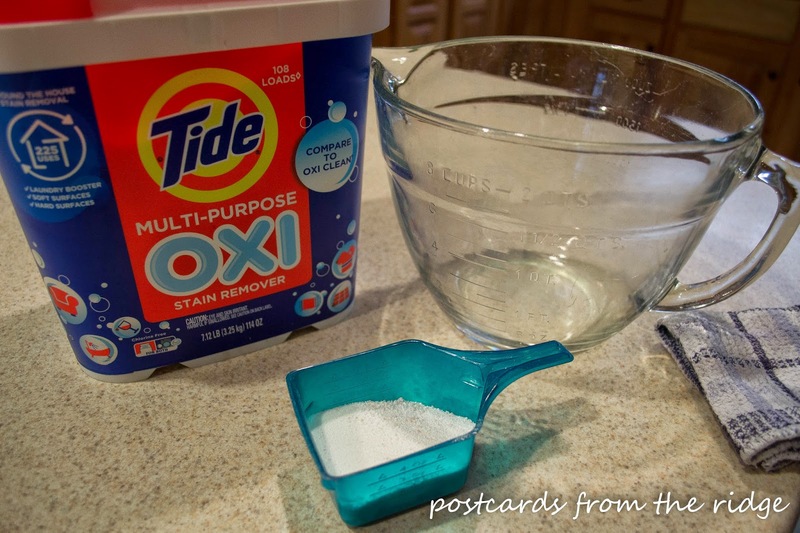 Thanks to Tide Oxi for the great cleaner. Have you tried it yet? It works on almost any household stain. Some areas it works wonders on are carpet stains, bathroom and kitchens, and fabric stains on upholstery. This turned out beautifully Angie! What a difference a little paint can make! Thanks Shanna! You're absolutely right about the difference a little paint makes!